A few weeks ago I spent a weekend in Wales with some friends. we fished the Wye on Saturday and Sunday and the Lugg on Monday. The fishing was tough. Saturday afternoon was probably the high point in terms of fish being willing to eat a fly. we had a few fish each fairly quickly to dries and nymphs. as the afternoon drew on I noticed a growing number of needle fly in the air. I moved to a 2 fly combination of a larger more visible dry as a spotter followed by a small (size 16) needle adult on the point, the results were quite amazing. I missed a lot of takes and connected with quite a few... what was remarkable was how fish were coming out of nowhere to have a go at the needle fly, even in the fastest shallowest water. my best fish was a 40cm grayling that ate the needle fly 5 times before I managed to connect. 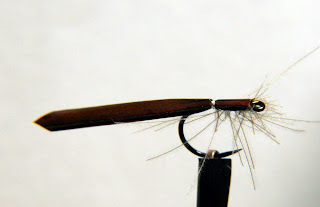 The needle fly pattern I used is extremely simple, consisting of a turkey biot tied facing forward anf then pulled back over a few turns of CDC which are tied in using a split thread technique. Phil White showed me this pattern while we were both tying at the Spring show this year... thanks Phil!